Top federal officials discuss plans for PFAS research with local stakeholders at Pease International Tradeport Thursday night. Federal researchers are getting ready to start a major health study of families who drank PFAS chemical-contaminated water at Pease International Tradeport. The project will be a model for the Centers for Disease Control’s first-ever national health study on the effects of industrial PFAS chemicals. But the study likely won’t include Portsmouth firefighters. Officials say the kind of exposure they and others like them have had to PFAS is too different from the study of PFAS in community drinking water. PFAS is a broad class of man-made substances used to make objects resist heat, grease, water, stains and more. The chemicals were barred from American manufacturing in the early 2000s. But they’re still used overseas – and they remain present in older products in the U.S., including actively used stockpiles of a common firefighting foam known as AFFF. The chemicals persist in the environment and human body, where even low levels of exposure have been linked in some studies to impaired kidney and liver function, high cholesterol, developmental and reproductive problems, and certain cancers. For its national study, the CDC will take applications from affected areas across the country that want to participate. Officials say they hope to study different kinds of contamination – in wells and public water supplies, from industry and firefighting activities, and more. The national CDC study will span several years and include at least 8,000 adults and children. The Pease study is smaller and will be used as a “proof of concept” for the national study. It will test the blood of 1,000 adults and 350 children – plus 255 unexposed people – who lived or worked around the Air Force base-turned-Tradeport. The complex’s drinking water was heavily contaminated by decades of military use of that toxic firefighting foam, AFFF. Patrick Breysse leads the CDC’s Agency for Toxic Substances and Disease Registry, as well as its Center for Environmental Health. At a meeting Thursday night at Pease, he said the model study will reconstruct sources of contamination and estimate how much people were exposed. 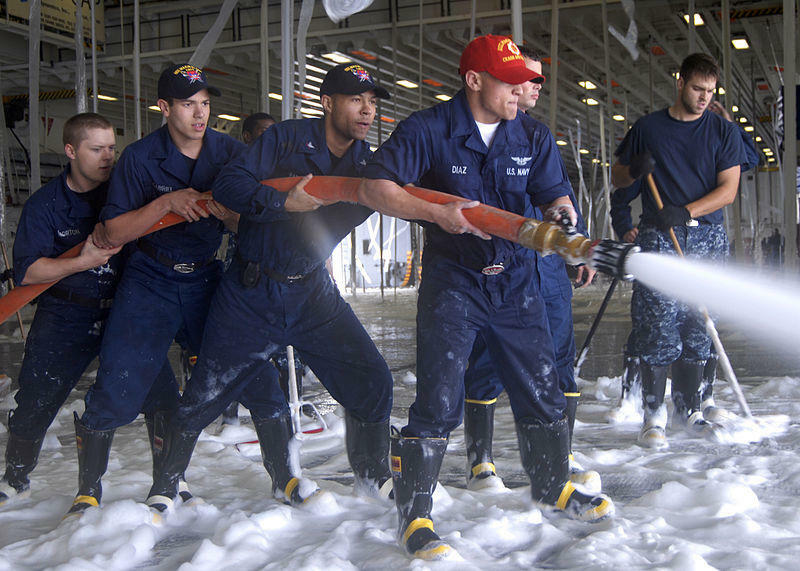 U.S. Navy sailors rinse toxic firefighting foam off the deck of a battleship after a systems check in 2010. “It’s extremely important if you know people who were there at the time, who participated in AFFF training or use – any firefighters that you know who worked at Pease – these are important people to get information,” Breysse told stakeholders and residents at the meeting. But while firefighters who worked on the base and used the toxic foams can contribute historical information to the study, they likely won’t have their blood tested as part of it. And despite calls from members of Congress and local activists, Breysse says they likely won’t be included in the national study, either. Past studies have shown firefighters have disproportionately high cancer rates – but it’s not clear if or how that’s linked to their PFAS exposure. Advocates say firefighters are just as likely to drink contaminated water in their communities. In fact, Portsmouth firefighters did drink the water at Pease. But they’re also exposed to PFAS more frequently and directly by using firefighting foams and, some research suggests, in the material of their protective gear. Officials say the CDC’s Pease and national PFAS studies will focus solely on community drinking water contamination, and so cannot include firefighters. Instead, the CDC has assigned the fire service issue to its National Institute for Occupational Safety and Health. NIOSH’s Health Hazard Evaluation director Teresa Schnorr said at Thursday night’s meeting at Pease that they are planning a firefighter cancer registry and seeking funding for more PFAS research across various labor sectors. They also plan to study how firefighters are exposed to various chemicals. But they don’t have specific plans for a study focused on both PFAS and firefighters – and officials couldn’t confirm if they were investigating the potential presence of PFAS in firefighters’ protective gear. Russ Osgood is a lieutenant with the Portsmouth Fire Department. He says he’s seen many colleagues die of cancer over the years, including some at a young age. 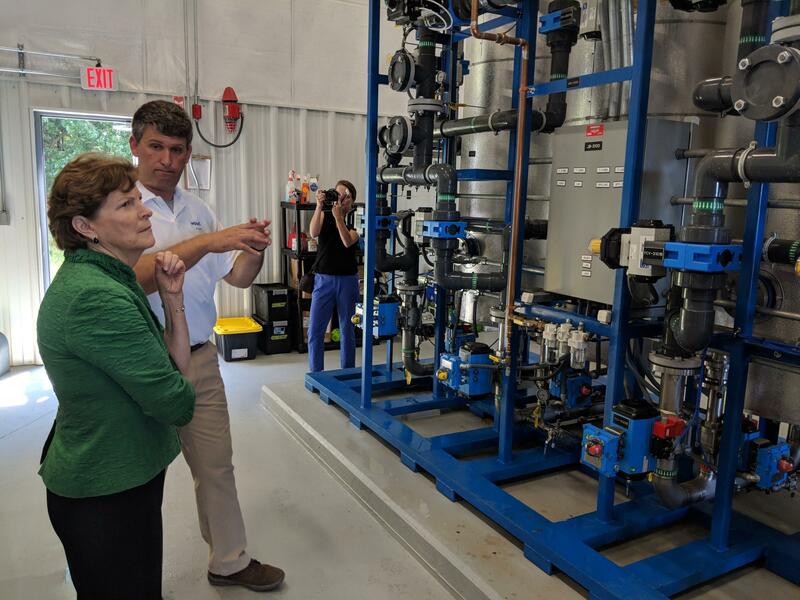 Senator Jeanne Shaheen inspects a first-of-its-kind treatment system the Air Force is using to remove PFAS from an aquifer at Pease. Federal officials are working on other policies and research that could help phase AFFF out of use entirely. And at a Senate hearing last year, the International Association of Firefighters said they support discontinuing AFFF and protective gear that may contain PFAS. Osgood and other local advocates say they’re confident they can secure more federal health research on firefighters’ PFAS exposures, after successfully advocating for the national study that will soon begin at Pease. Testing for Pease co-founder Andrea Amico has become a leading national PFAS activist since her husband and children drank contaminated water at the Tradeport. Most recently, she joined New Hampshire Sen. Jeanne Shaheen to highlight the issue at the State of the Union. Amico said at Thursday’s meeting that she’s heard from lots of locals who want their blood tested in the Pease study – as well as communities across the country who want to participate in the national project. “There are people that aggressively part of this process, so we want them to know as soon as possible when it’s time,” she told CDC officials Thursday. The CDC says they hope to launch the Pease study this summer and the national study next spring. In the meantime, they said residents who want to contribute in any way should keep in touch with activists like Amico. 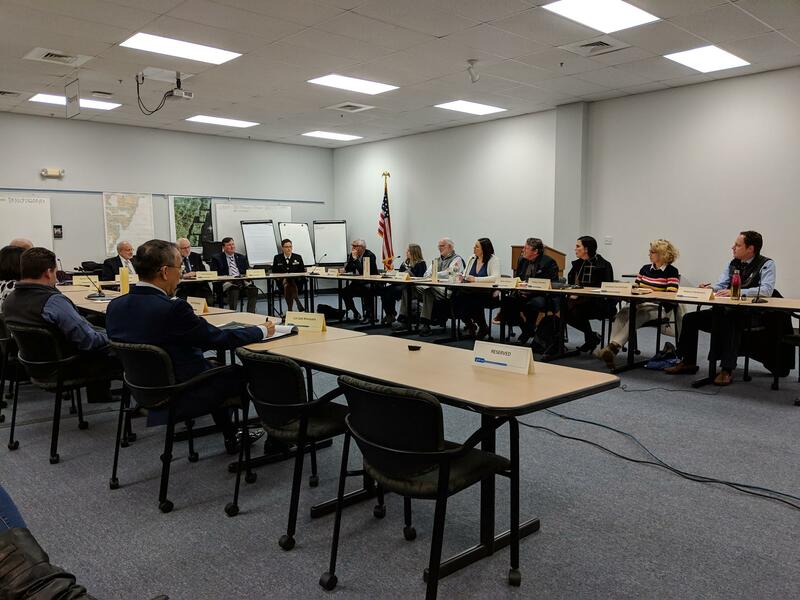 Amico also repeated a request at Thursday’s meeting for the CDC to spearhead a medical monitoring program for PFAS. This would give doctors ways to screen for the effects of contamination during routine care for affected people. Amico says it would help while they wait on CDC data from the Pease and national studies, which could take years to gather. "The PFAS issues are not going away. And I understand that it's hard, but just because something's hard doesn't mean I'm not going to ask for it," Amico told CDC officials. "There are many parents from this community that want to know what they can do to keep their children safe today and to monitor their health." The CDC's Breysse says it will be difficult to fit that into their agency’s mandate - especially as the scientific consensus on the health effects of PFAS is still evolving. They said activists should look to public health organizations to lead the charge. A first-of-its-kind water treatment system has begun filtering high levels of toxic PFAS chemicals from the groundwater at Pease International Tradeport. It’s the latest, biggest phase of millions of dollars in government response after PFAS was found in a drinking water well at Pease in 2014. 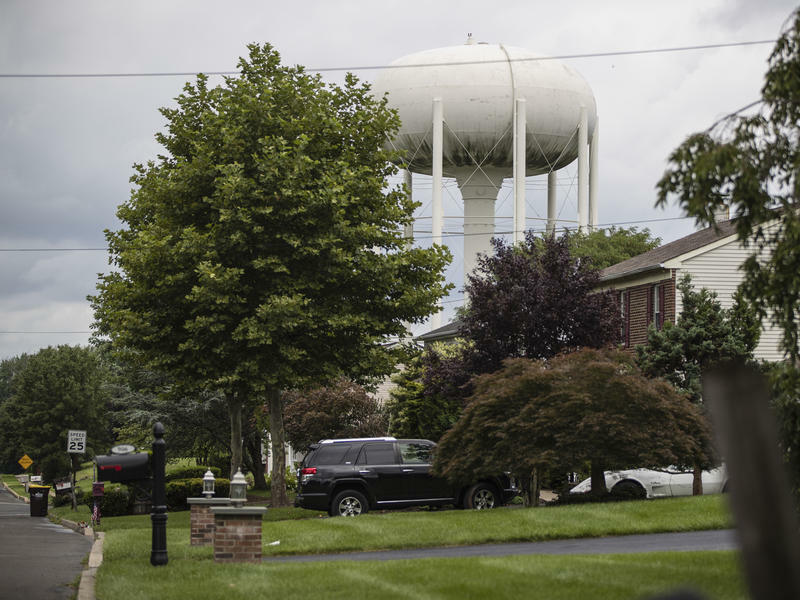 The state’s public water systems might have to pay millions of dollars to comply with new proposed limits on certain industrial chemicals in drinking water – even as advocates say the proposals aren’t strict enough. Veterans and families who lived and worked at the former Pease Air Force Base want the government to begin collecting data about their disease rates and possible ties to chemical exposures on the installation.